The memoir of one woman’s emotional quest to find the art of her Polish-Jewish great-grandfather, lost during World War II. The everyday lives of the Polish-Jewish community depicted in Moshe Rynecki’s paintings simply blended into the background of Elizabeth Rynecki’s life when she was growing up. But the art transformed from familiar to extraordinary in her eyes after her grandfather, Moshe’s son George, left behind journals detailing the loss her ancestors had endured during World War II, including Moshe’s art. Knowing that her family had only found a small portion of Moshe’s art, and that many more pieces remained to be found, Elizabeth set out to find them. Before Moshe was deported to the ghetto, he entrusted his work to friends who would keep it safe. After he was killed in the Majdanek concentration camp, the art was dispersed all over the world. With the help of historians, curators, and admirers of Moshe’s work, Elizabeth began the incredible and difficult task of rebuilding his collection. 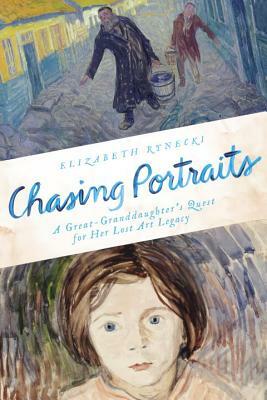 Spanning three decades of Elizabeth’s life and three generations of her family, this touching memoir is a compelling narrative of the richness of one man’s art, the devastation of war, and one woman’s unexpected path to healing. Elizabeth Rynecki is the great-granddaughter of the Polish-Jewish artist, Moshe Rynecki (1881-1943). She grew up with his paintings prominently displayed on the walls of her family home and understood from an early age that the art connected her to a legacy from “the old country”: Poland. In 1999, Elizabeth designed the original Moshe Rynecki: Portrait of a Life in Art website. Today, she continually updates it to keep it current regarding academic research, educational resources, and tracking lost Rynecki paintings. Elizabeth has a BA in Rhetoric from Bates College and a master’s degree in Rhetoric and Speech Communications from UC Davis.